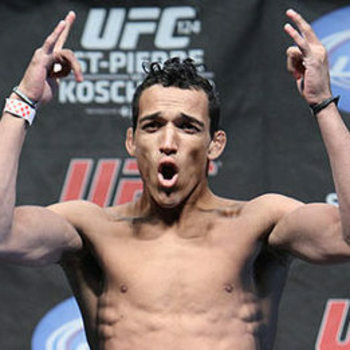 UFC lightweight Charles Oliveira. Photo credit: Zuffa, LLC. Charles Oliveira delivered an illegal knee to Nik Lentz, who still had at least one knee on the ground, during their lightweight bout Sunday evening at UFC Live 4 in Pittsburgh, Penn. Unfortunately for Lentz, the referee did not see the knee, and a few seconds later Oliveira sunk in a rear-naked choke on his injured opponent and forced the tap. The Pennsylvania Athletic Commission plans to review the fight to see if it warrants a change in ruling to a “no contest”, and in the meantime, the UFC has witheld Oliveira’s win bonus. However, Oliveira and Lentz were both awarded “fight of the night” honors and took home an extra $50,000 each for their efforts. Oliveira told Tatame magazine he would change that “fight of the night” money for the victory if he could. Fortunately, he can not do that — that would be what is commonly referred to as “a bribe”, but we get the point. “I didn’t realize he was still (with a knee) on the ground… At the heat of the moment, I wanted to knock him out or submit him. The knee landed and the referee didn’t stop the fight, then I hit him again with another knee. The first one was illegal, but it didn’t hti [sic] him on the jaw, and he kept fighting, trying to take me down. The second one actually hurt him”. “We’re just waiting. I left that in God’s hands, but I think it won’t happen (they won’t change the result). He didn’t go out, he kept on the fight and stood up, then he felt the second knee. There’s no reason to not give me the victory”. What say you friends? Does Oliveira deserve the win or should it be ruled a “no contest”? If you missed the fight, you can read ProMMAnow.com’s LIVE play-by-play analysis as the incident happened.